(1) BIG READ AT CLIFTON’S. The graphical flourishes of the new Clifton’s Cafeteria website are worth a click. 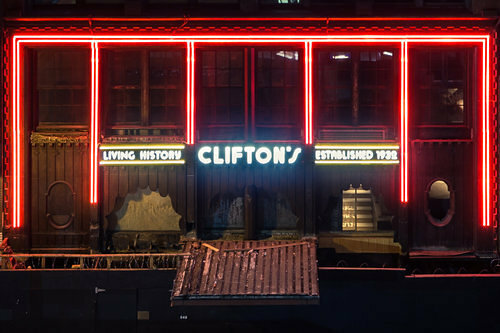 LA’s refurbished deco monument has a Bradbury-themed event slated this weekend — “Celebrate Ray Bradbury’s ‘Fahhenheit 451’ at Clifton’s on Sunday”. On Sunday, May 22, at 5 p.m. the city Cultural Affairs Department will celebrate Bradbury’s Fahrenheit 451 as part of its citywide “Big Read” program. In the book, literature is prized and firemen are people who start, not put out fires. The title references the temperature at which paper burns. At the event, dubbed “When We Reach the City” (those are the last words in the book) writer and Libros Schmibros founder David Kipen will join Bradbury’s biographer, Sam Weller, for a discussion of Bradbury’s life, work and thinking about Los Angeles. A batch of special guests will join them. Clifton’s is a fitting location. In a 2002 interview with Los Angeles Downtown News, Bradbury reflected on how, decades ago, he and a group of compatriots regularly showed up there. (2) BRADBURY STATUE. Three finalists have been chosen to submit proposals for a statue to commemorate the life and achievements of author Ray Bradbury reports the Lake County Sun. They’ll have a $125,000 budget. Bradbury, who grew up in Waukegan, is to be honored with a statue on the grounds of the Waukegan Public Library in the city’s downtown. The finalists are Clay Enoch, of Loveland, Colo.; Mid Ocean Studios, of Providence, R.I.; and Zachary Oxman of Rockville, Md. Each finalist will travel to Waukegan in early summer for an interview with the Ray Bradbury Statue Committee, with the final decision to be announced in early fall. “We deliberately chose three very different finalists with a wide range of skills. We’re confident that with the finalists’ experience and strength of previous work, they will create something that will celebrate the life and work of Ray Bradbury,” said Richard Lee, chair of the Statue Committee and executive director of the Waukegan Public Library. The finalists will visit the site in early summer to view landscaping considerations, traffic flow, and building architecture, and to be interviewed by the committee. They will then submit proposals for the statue design and any associated landscaping to the committee for a final evaluation, officials said. Last year, the Statue Committee issued a request for qualifications to sculptors of public art. The committee, composed of community and arts leaders, received 41 responses from artists throughout the U.S. and around the world, including as far away as New Zealand. In April, committee members met to discuss the application packets and select three finalists to present proposals for the project. The finalists were chosen based on the strength of their qualifications, including similar project experience and a portfolio of work. 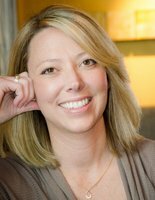 Making a decision wasn’t easy, according to committee member Lori Nerheim. (3) HIS HOUSE LIVES ON IN ONE AUTHOR’S IMAGINATION. Nicole Meier was interviewed about her novel The House of Bradbury by The Oregonian. The Bend author pays homage to Ray Bradbury, author of the science fiction classic “Fahrenheit 451,” in both the title and plot of her fiction debut, “The House of Bradbury” (SparkPress, 280 pages, $17). In the book, being published Monday, a struggling writer learns that Bradbury’s Los Angeles home is up for sale and decides to buy it, hoping she’ll enjoy inspiration by osmosis. Q: Why did you choose Ray Bradbury as the author whose house your heroine would lust after? My interest was piqued when I came across a newspaper article featuring the sale of Ray Bradbury’s Los Angeles home. I could tell from the photo of the charming yellow house, where the iconic author resided for half a century, that the interior was full of stories. Like my protagonist, I wanted nothing more than to get inside and discover its secrets. I later learned a developer purchased the home, and planned to raze it to the ground. As a Southern California native, familiar with the neighborhood, I wanted to imagine a world where the house wasn’t demolished, but instead purchased by an appreciative writer. (4) NOW THAT’S A TATTOO! See a LARGE version of Wendell Minor’s painting for The Illustrated Man (1975) at the Sci Fi Art Tumblr. (1) That website is indeed nifty to look at. Don’t recall when I’ve ever watched a header with such interest. Please don’t tell my wife or doctor but I will be having a chocolate malted in Ray’s honor while attending this event. It will be more than the dime it cost Ray in 1937 but it’ll be worth it. JKT: Please don’t tell my wife or doctor but I will be having a chocolate malted in Ray’s honor while attending this event.